In art we sometimes see that the more an artist concentrates on his or her materials, the higher the spirit of the work can soar. This applies to Mireya Samper’s recent work where she uses Japanese paper, Icelandic rocks worn smooth by the sea, coloured water and silver leaf. This choice of materials gives the art an almost metaphysical dimension and we sense the hardness of the rock, the lightness of the paper, the fluidity of the water and the clear shine of silver. Mireya ties them all together by using the same shape, a droplet, in many of them, drawing it in ink on the paper with a broad brush or carving it into the rocks and accentuating it with the silver leaf. There is a simple strength to this approach that is reminiscent of Japanese traditions and Mireya has sought inspiration there, particularly when it comes to her choice of materials and the installation of her work. This can perhaps be best seen in her works on paper and paper, indeed, place a large role in Japanese art and aesthetics. “Western paper turns away the light, while our paper seems to take it in, to envelop it gently, like the soft surface of a first snowfall. It gives off no sound when it is crumpled or folded, it is quiet and pliant to the touch, as the leaf of a tree.” This description is from a book by the Japanese writer Jun’ichirō Tanizaki, In Praise of Shadows, where he attempted to explain the importance of aesthetics in his country. According to tradition, washi paper is made with fibres from the bark of certain trees, not from wood pulp which is most commonly used in the West and it really does seem to have a very different presence. It seems thin but is actually quite strong, it seems nearly transparent and it does seem to respond differently to the light so that the ink drawings on the surface come alive, as though lit from within. Mireya makes full use of these characteristics when she paints her simple shapes in ink and then hangs the paper in the space and lets the play of light and shadows bring it to life. Tanizaki also wrote about the shadows that he considered to be the key to understanding Japanese ideas about beauty. “The quality that we call beauty, however, must always grow from the realities of life, and our ancestors, forced to live in dark rooms, presently came to discover beauty in shadows, ultimately to guide shadows towards beauty’s end.” This thinking can be found in all of Mireya’s work and it guides her approach to her materials. It is no coincidence that she has also created many outdoor works where she uses nature directly, only adding the bare minimum necessary to express her idea in the environment. In this exhibition nature is also present in the materials used and because of this the works seem to open the door to an experience of beauty that lies beyond the man-made, in the material and in nature itself. Mireya Samper’s work for the exhibition Myth of Modern Times in Chile in 2000 is characteristic of her subjects and methods. White cotton strips hang from the ceiling, forming a spiral that visitors can walk into, leading them to the middle of the work where they are surrounded by white under a strong light. The strips are covered with acrylic plastic layer, the outer ones completely, then less and less as you go further in. The plastic represents the outside world and its pollution; the guests’ path in the spiral is a journey towards their own essence, the purity within them. This is where environmental concern and spiritual quest come together in a powerful and simple installation. Mireya works in a variety of materials depending on the idea that they serve and external circumstances. She has created numerous site-specific installations around the world, such as pieces of acrylic and spices associated with the Khasi religion in India, a silver bamboo forest and floating leaves in Japan, the infinity sign in paper in a Lithuanian forest, coloured sand beside a temple on an island in Southern France, an installation of flowers, living light and coloured water in an old jail in Mauritius, and sculpted sea stones in Drangsnes and Garður in Iceland. Behind these works lies a clear concept developed in local materials. Samper’s drawings are often more spontaneous, executed with intuition, in flow. All these works have in common certain themes that run like recurrent threads throughout her œuvre. Delicacy and transparency characterize many of Mireya Samper’s works, especially the Fusion series, where two pieces of paper are superimposed. Yet there is great strength in these installations, in her way of framing the pieces and occupying the space, capturing the viewer’s attention and leading him towards, and sometimes into, the work. Good examples of this is the Samryskja spiral she did for her solo exhibition in Kópavogur Art Museum in Iceland in 1999 and her exhibition Manasthithi: A State of Mind in India in 2003. The artist delights in dissolving and shifting accepted boundaries between painting and sculpture, two- dimensional and three-dimensional works. One of her sculptures is only a few centimetres thick, while her paintings are frequently made on paper that has a certain thickness and a living surface, in up to 10 cm thick frames that hang in the space and can be moved around like a sculpture, or simply stand on the floor. Transparency also lets the space flow and blurs the line between the different pieces. Mireya Samper has said that she wants to express “the fusion of the outer and the inner world”. Just as man is part of the great universe and at the same time owns his inner, personal life, Mireya’s works are parts of the environment, of a geographical, social and cultural context, and at the same time have their intimate expression, their nuances and character. Mireya Samper cares about nature and is environ-mentally minded, as is subtly evident in many of her works. She also cares about man and his fate, as can be seen in pieces she has produced in two former prisons in Chile and Mauritius. There, her works have a kind of healing effect, in memory of suffering and in respect for life. Water, in various forms, is one of Mireya’s favorite subjects. She has put coloured water in clear plastic bags, as a symbol of joy and vitality. The drop form appears in various ways: carved in rocks, as floating sculptures or hanging baskets of flowers in memory of prisoners. For Mireya this form is mainly associated with tears, these “offsprings of thoughts.“ Water drops also relate to time and the infinite. In her exhibition Water Worlds in Reykjavik in 2005 she showed big paper works with a marble sculpture in which two drops surrounded by water generate the the symbol for infinity ∞. Infinity is a representation of the universe and Mireya’s works exhort us to meditation and internal inspection, while being related at the same time to the “outer world“ and the cosmic. In her installation on Frioul Island in France she used the octagon – present in old hospital buildings on the site – as a reference to the universe and to ancient geometric science. The spiritual reference in her works is not associated with any one religion in particular, and her series of drawings Prayer seeks inspiration in mankind’s meditation and hopes, irrespective of place and faith. Mireya uses light or a reference to it as a symbol of our inner self, of something higher, of peace and universal value. It is often represented by silver, on stone, wood, leaves or paper. This light is that of the moon, the feminine light of night that rests, heals and prepares for the arrival of dawn and the sun. 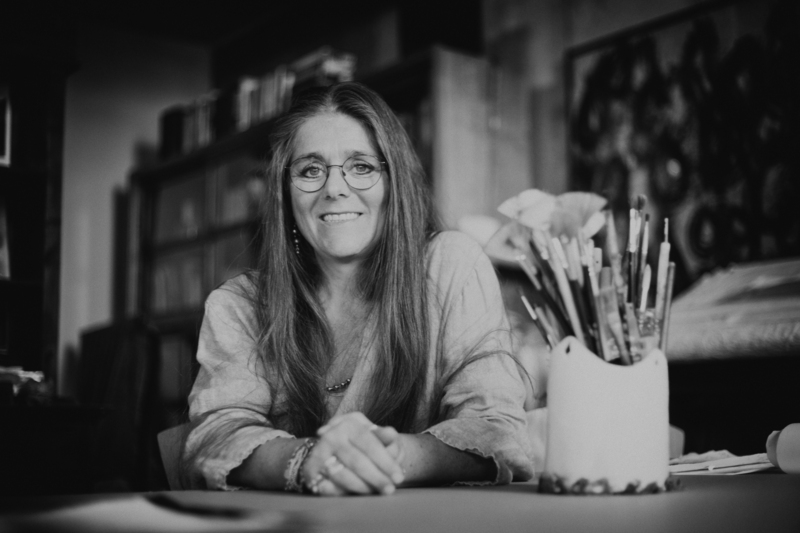 Mireya Samper’s works encourage us to connect to ourselves and at the same time to open up towards the environment, nature and the sacred in all.